The perfect hideaway for couples, this brand new hotel is one of the most beautiful resorts in Cuba. Designed especially with relaxation in mind, it boasts a great location and facilities to match. Beautiful hotel, lovely staff and food BUT I booked this hotel for my wedding because it had a crèche. On arrival I found the baby area was outside, dirty, unsafe and anyone could wander into it. I wouldn't leave my dog in there. Hotel tip: Building work until Oct 2014 near Romantica restaurant, request room on opposite side of resort. If you want a lovely holiday where the people cannot do enough for you then this is it. We have been to Playa Pesquero twice and would definitely go back. There are many water sport for everyone to do, and staff available to help if you have never tried things before. The beaches are beautiful, and the pool is great. Plenty of beach loungers both by the pool and the beach. Food is lovely and plenty of places to eat, whether it's snacks or full meals. Pizza and fish, along with drink facilities on the beach, so never have to walk far, staff also on hand to offer service. Bungalows we have been in we cannot complain about, as both times we were in really good maintained ones. Cleaned daily and maids are fab. The gardeners are also really friendly, leaving little gifts on the balcony each day. Fantastic place. Hope to go again soon. Yes it’s good that Thomson has the bus check in system, however when three coaches of guests arrive at the same time it does take a while for the buggies/trains to get everyone to where they are going. It’s worth considering setting off on your own to find the room all the paths flow around anyway. Started with room 3806 which was very nice but the air conditioning didn't work and was just like a tiny fan. Called maintenance and they did make it a little better for 24 hours until it failed again. We went to reception and asked to be moved rooms which they did with no hassle, moved to 3403 and the air conditioning was refurbished and much better. So please do ask to be moved as it is worth it. Its Cuban and therefore basic Chicken, Pork or Seafood in every restaurant. Service in some restaurants including Romantica lacked and for example we only had one drink in there because they didn't refill glasses including the water. However lunch in La Trattoria was excellent, fast and an empty glass would always be refilled within minutes without asking. No need to reserve sun beds so why people do is beyond me, there are lots left at lunchtime and some people just reserve the ones nearest the pool steps and never come to them which is more annoying than reserving them and at least coming to them at some point in the morning. However this isn't the hotels fault and is a worldwide problem with lazy people. We preferred the quite left side of the beach, however beach shoes are required for the sea as there are sea urchins. Water sports were excellent. We flew premium class, definately worth the extra expense, although the cabin crew on the outbound journey were somewhat lazy and spent much of the flight gathered together in the forward galley chatting. They made it clear that if you wanted a drink you had to get it yourself and not expect to be waited on. The crew on the return journey however were kean to serve. The journey from the airport was a real eye opener. Having read other reports of how poor the locals are, we really wasn't expecting to see people living in almost derelict apartment blocks and what can only be described as large garden sheds. We saw the locals travelling in what appeared to be very old cattle trucks, using them as buses. We arrived at the hotel an hour later....in pouring rain! As we waited to check in, a small bar had been set up serving rum punch. We got taken to our room in a golf buggy by a very friendly guy called Jorge who insisted that he carried both our bags up the stairs to our room. He also checked that the mini-bar had been filled and showed us how to use the safe. The room that we had (4907) was large with a huge bed, a good sized bathroom and a basin that was adjacent to a dressing area that had plenty of hanging space. The balcony was large with two chairs and a table. The only downside for the room was the two seater couch and armchair, that stunk of stale sweat, although it was only evident if you sat on them. The resort is huge. Another report has described the layout as being similar to Centreparcs which is a good comparisson. Small blocks of rooms are set amongs the trees with pathways to resemble railway tracks leading the way to all corners of the resort. The pool, as others have said, is huge and would probably take a good six minutes to walk around the perimiter. The swim-up bar is a great place to chill out but can get very busy after lunch. The bar staff here work very well together and they all interact with the guests. Make sure you ask for a Chocolate Monkey at this bar, don't know whats in it but its good. The toilets especially around the pool area aswell as some of the restuarants are poor and not particularly clean. Missing toilet seats and foul smeels are not what you expect from what is listed as a 5 star resort. The buffet restuarants have a reasonable choice of food but after a fortnight it does get a bit samey. The best roast chicken in the world is served in a small restuarant, at lunch times only, adjacent to the beer garden. The a la carte restuarants are worth a visit, but remember to make your reservations for these in the conference room near the reception at the start of your holiday, and gents, you have to wear long trousers. Wine is served by the bottle! Service at the lobby bar can be a bit slow. The beach is stunning, but......the sand fleas bite like hell. Some guests were absolutely smothered in bites that had blistered and were on medication prescribed by the local doctor to ease their discomfort. One guest even spent time in hospital because of the bites. This really put us off from going to the beach especilly as we both got bit on the two occassions that we went on it for a short walk. The evening entertainment consists of a dance show, a dance show and oh yeah.....another dance show. Perhaps for one night its probably good to watch, but every nite!!!!! The best thing about it was that it finished before 10:30. Some other things to note....ladies make sure you have all your neccessary sanitary wear because you can't buy it anywhere on or near the resort. 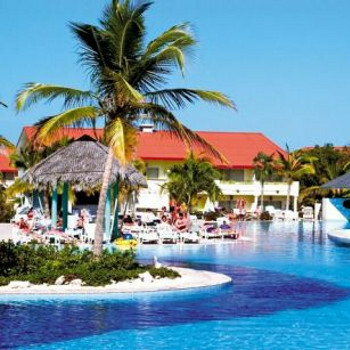 The swim with the dolphin trip is a must and the overnight trip to Havana is also good value. This trip is sold to include a nite out at the Tropicana nite club (more dancing) but we didn't fancy that and got a substancial discount on the cost of the overall trip. We only had 4 days of sunshine and vitually continuous rain for the rest of the holiday. Was it the rainy season? Other reviews suggest it was. Cuba is an amazing place with beautiful beaches, green countryside and extremly friendly people. We would recommend this hotel but check the weather forcast before you go. Upgraded flight with Thomas Cook which was good. After arriving at hotel, checking in was quick and was promptly taken to our room with our bags by a golf buggy. This hotel is ENORMOUS but there are plenty of the golf buggies constantly travelling around all parts of the resort and the driver's always ask if the can give you a lift wherever you want to go. The hotel was extremely clean and the gardeners worked tirelessly to keep the areas looking spotless. I have, however, only awarded a 4 due to the plastic cups/glasses that were left lying around the pool area. This was of no faulty of the staff but of the holiday makers who couldn;t be bothered to place them in the bins. Rooms were cleaned daily and the mini-bar restocked with what had been used. The hotel food was good, especially the a la cartes which we frequented for most of our stay. Be warned, men MUST wear long trousers or they won't be allowed in. The sevice in these restaurants was brilliant. The beach was idealic. Shade was provided by some sun shades but it was the grape trees that provided most of the shade. It was a typical carribean beach that has been left untouched.Beautiful. The town was not too far away, however, we did not go into it as we would just laze around the ENORMOUS pool. It is so big that if you stand at one end, you can't see the other end. So many sunbeds available whatever time of the day you went to the pool. The staff in the pool bar were so friendly and would cater for your every need. We did do a couple of trips that took us into the local villages. These were something else. If you go, take 'gifts' for the villagers and give them out on these trips. We took baby clothes, pencils, sweets, tins of drink. Anything is so welcome. We even saw disposable nappies that had been washed and hung out to dry. Although these people have very little material things, they have a wealth of friendliness to give. The sunser cruise is a must. An all inclusive bar on board a catamaran where you sail out to sea and cruise for a couple of hours, then crack a bottle of champagne as the sun sets. It's an awesome sight. The only down side to this hotel, is the entertainment. It depends on audience participation but when you think how much you have paid for this holiday, I for one, would like to be entertained and not provide the entertainment. Would I visit this hotel again - Most definately and I have already booked up for my next visit to which I can't wait. Arrival at the hotel was suprising as we weren't expecting much due to previous reports so it looked very nice. Check in was a little bit confusing as the rep on the coach didn't explain that we were to leave our luggage in reception and go to the conference room were everyone was checked in, so we dragged all the luggage there and back with no trolleys and a young child this was a bit difficult. So a tip for you leave your luggage at reception! the porters do the rest. The room was nice and spacious everything you need hairdryer, iron and board, fridge, etc not much wardrobe space though. We did ask for pool or sea view but most of the apartments are well away from both, our location was quite central to everything 16 block. Food was edible and quite a good variety again we were not expecting much so we were pleasantly suprised. You can book all your restaurants at the begining of the holiday and if you miss one of the reservations take your ticket back and change it for a different day. We went to the seafood which was nice. The romantica was well organised very nice staff and food was nice, The asian wasnt as good we were party of 3 table only set for 2 had to ask for cutlery etc and it was full of cats!!! Also asI sat on my chair it was wet through hope it wasnt from one of our 4 legged friends!! We also went to the grill during the day the salad and choice was lovely but at the night time the meal wasn't good. All in all the food was good sometimes you had to queue in the morning for omelette bt ususally it was good. A particularly good waiter in here called Alexi looked after us as he did everyone, he is very good at what he does always has hot coffee, hes very polite and speaks goodEenglish, he's also sometimes at the pizza hut on the beach. You noticed the difference if he wasnt there as sometimes you'd be waiting for coffee and would have finished your breakfast. The beach is like paradise the sea is really clear good for snorkelling all the pedaloes row boats and sail boats are free you just need to get a ticket for your allocated time from the towel hut you can borrow snorkelling gear from here for approx 2 hours free. We didnt go around the pool much but it is massive theres no need to get up at crack of dawn like saddoes to put towels on beds there's always plenty. Theres a mobile bar man that comes around the pool and on beach on the left side. The entertainment wasnt up to much the dancers were very good but after 3 nights in a row it got a bit repetetive. Our daughter didnt want to go in the kids club but it didnt look very appealing, the mini disco was a bit of a flop too, she did join in the shrek show that was nice as all the kids got dresed up. The gardens are beautiful and very well kept and the gaardeners only seem to have a big knife to do all the work. Overall we had a nice relaxing holiday the weather was brill for xmas time very warm,cloudy on about 4-5 days of the fortnight. I would probably say the hotel is a 3 star it needs up grading in the public areas :-toilets, seating and night club, but looking at what the country has i.e where they live, it probably seems like paradise to them. Although they appear to live in poor conditions in the little straw huts they are lovely friendly people and all look happy they wave as you pass them on the road side and a couple of pesos for a tip will probably go a long way. I probably wouldn't go to this hotel again but then I dont like going back to the same places but I would definately go to Cuba again. My boyfriend took me here as my 21st birthday present, i was a little worried about the 10 hour flight at first but the plane was fine and there was plenty of in flight entertainment! On arrival i was speechless as how beautiful the reception area of the hotel was, and was even more impressed once we were shown to our rooms, they were clean, spacious and the air con was a dream (we needed it)! The staff are really friendly and always on hand to help, one particular member of the bar staff we became very friendly with and we didnt even have to ask for another drink once we had finished, he would have it ready and waiting for you! The maid who cleaned our room was excellent and would leave animals and shapes made out of towels on the bed. The food was lovely and our favourite restaurant was the Romantico - beautiful steak! We did a few excursions and swimming with the Dolphins was a dream come true i have always wanted to do that, our other favourite excursion was the speed boats, where you got to drive you own for an hour, these we felt were reasonably priced as well! We throughly enjoyed our stay at this hotel and couldnt fault it in anyway, we would definatly return and recommend it to everyone!